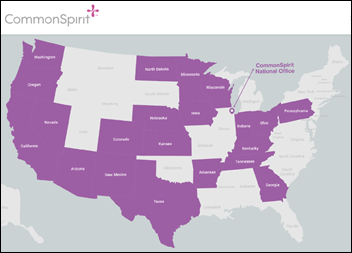 Dignity Health and Catholic Health Initiatives complete their merger to form the 142-hospital, $29 billion CommonSpirit Health. The new health system said in the announcement, “We didn’t combine our ministries to get bigger, we came together to provide better care for more people.” I’ll be interested to see the post-merger metrics that prove success beyond the “bigger” part. CommonSpirit Health will be run by co-CEOs (a horrible idea) from its ritzy headquarters in Chicago. The system does not otherwise operate in Illinois. Interim co-CIOs Laura Young-Shehata and Denis Zerr are running IT until a replacement for Deanna Wise is hired. From Significant Brother: “Re: HIMSS health IT trends forecast. What did you think of it?” I didn’t see anything in it that was particularly insightful or interesting, to be honest, so I didn’t even mention it (plus they called it the “first annual” report, which is a journalistic no-no – you describe something as “annual” only after it has been around for two years). 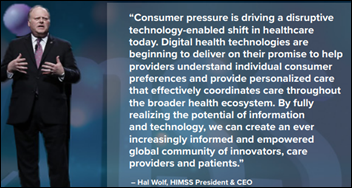 The full-body photo and boilerplate quote from CEO Hal Wolf did little to dispel the perception that it’s just a vanity piece intended to remind everybody how influential HIMSS thinks it is. It also focuses entirely on care providers rather than public health (the former has only a tiny impact on the latter). We have the cliche reference to “the perfect storm” and the yet-again maturing of digital health. The report was obligingly parroted as news by the HIMSS marketing – err, media – division. That group just did a conference tips video that was absolutely painful, ranging from the obvious (wear comfortable shoes, make a schedule, allow enough time between events) to the self-serving (watch HIMSS TV, track down the social media ambassadors as the “celebrities of HIMSS,” and read the vendor-friendly HIMSS publications). 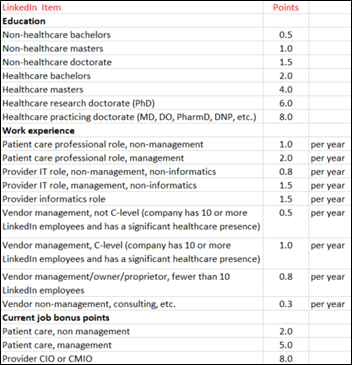 Here’s my scorecard from two years ago on rating self-proclaimed industry thought leaders, which might work well in scoring the LinkedIn profiles of those “celebrities of HIMSS” in the form of social media ambassadors. I hadn’t heard of a particular one, so I checked that person’s LinkedIn and calculated a score of exactly zero — no healthcare experience, no degree, no membership in HIMSS, few health-related tweets, few health-related followers, and a ton of Twitter followers that mostly seem to be the phony ones you buy online to look influential. From Crafty Ploy: “Re: HIMSS. Are you interviewing CEOs there?” No. I attend anonymously with a phony name, job title, and employer name on my badge. I meet with no one, attend no parties, and don’t even utter the word HIStalk. I just trudge the exhibit hall and then go back to my VRBO place to write up what I saw and heard. You can’t be objective while hanging out with executives or sucking up trying to bag ego-flattering speaking engagements or advisory board positions. Remaining anonymous keeps me objective and transparent since it’s all right here on the page. From Truant: “Re: Best in KLAS. I didn’t see some department systems in there, like pharmacy.” Best-of-breed ancillary systems have mostly died off. First to go were pharmacy and medication administration systems (due to the need to integrate with ordering), then radiology, and finally lab systems. Those departments liked their standalone systems better, but were outvoted in favor of enterprise integration. About the only survivors in hospitals – and it’s a short-term position as Cerner, Epic, and Meditech eat the world – are LISs from Orchard, SCC, and Sunquest. You do not want to be a standalone hospital system vendor whose company future depends on your customer not ousting you in favor of their EHR’s integrated module. The appeal is obvious — integration becomes a single vendor’s problem and you’re down to one throat to choke. From Ignoble End: “Re: doctors getting lap dances to prescribe opiates. What’s the world coming to?” The world has already arrived at this destination. Regardless of their expressed noble intentions, everybody (doctors, corporations, patients, software vendors, social media platforms, and politicians) will do whatever rewards them the most. Your only hope is that their most-sought reward is something more altruistic than cash, but you’ll be wrong in most cases. It’s also true that doing something slimy that involves only a relatively small punishment is still a net win. It’s nice but unreasonable to think that doctors are more virtuous than the rest of us. Three-fourths of poll respondents say they’ll be working harder next week, with identical percentages for attendees as well as those left behind. Let’s agree not to think about how much productivity is lost from attending the annual spring boat show. New poll to your right or here: Did the VA make the right decision in abandoning its Epic schedule pilot and implementing Cerner instead? 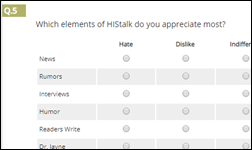 My once-yearly reader survey has drawn the usual mix of positive and negative, but I appreciate every response equally because someone cared enough to fill it out — indifference kills more sites than anything. One randomly chosen respondent will be reimbursed (aka “paid,” but we coyly don’t call it that in healthcare) with a $50 Amazon gift card, so fill it out and nobody will be the wiser whether you’re being nice or just looking for Amazon giftage. I try not to peek before all responses are in, but I’m touched by how many folks have kept reading even after they retired or moved to other industries, as well as by those who apparently worry daily that HIStalk will have gone dark because I’ve lost interest or died (I’m hoping for the former if forced to choose). I can also say that while my audience is self-selecting, I’m sitting on a treasure trove of their feedback that tells me why they keep reading year after year and everybody knows that rewarded behavior is likely to recur. Here’s the digital technology that could revive Apple and maybe some people besides – create a real-time sensor for measuring blood levels of alcohol and recreational drugs, or use existing ones to detect overdose symptoms and call a pre-defined friend for help. I got wrapped up in the music that was cranking in a small store I was in the other day, picking up on some deep tracks from Pink Floyd and a few other prog bands. The kid working said it was a Pandora Pink Floyd playlist customized via extensive use of the thumbs up/down option, which I always forget about. It had a few missteps, such as Credence and the Rolling Stones because older people listen to older music and fool the algorithms, especially Spotify’s, into thinking the bands are similar. My search for early Pink Floyd jams led me to new music from Rodrigo y Gabriela, a Mexico-based acoustic guitar duo whose all-guitar cover of Pink Floyd’s “Echoes” (from 1971’s “Meddle”) is perfect. I then understandably needed to revisit the stunning original, as recorded by the visionary Floyd live (using their regular touring gear) in the ruins of Pompeii in 1972 with no audience present in a brilliant exploration of a new art form by impossibly god-like band members who were all in their 20s. The contributions of the underappreciated Nick Mason (drums) and Richard Wright (keyboards and vocals) are evident, even more so on “A Saucerful of Secrets.” No crowd noise, no idiots waving cell phones, just the band getting deep into the zone in broad daylight (for some of the tracks) while ignoring the film crew. Just because it’s not loud or flashy doesn’t make it for stoners only. Music as contemplative art for the ages – what a refreshing idea. If Pink Floyd isn’t your thing (how is that even possible?) then there’s new music from one of my favorite hard-rocking bands, Norway’s The Dogs. Dear industry people who aren’t technologists: please stop using the phrase “full stack” immediately. Thank you. 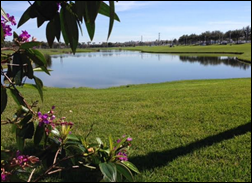 Orlando’s weather for HIMSS19 is looking about as good as it did in 2017 in my photos from then above, with highs predicted to be around 80 and lows in the mid-60s. 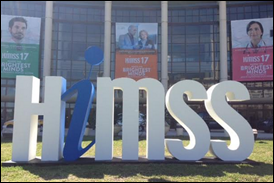 You’ll be sunning yourself while sprawling in the convention center’s questionably hygienic grass under that HIMSS sign before you know it. Welcome to new HIStalk Platinum Sponsor Avaya. The Santa Clara, CA-based company offers unified communications and contact center products and services. For healthcare, that means collaboration solutions (mobile communications, multimedia, automated workflows); patient services (resource matching, omnichannel solutions, automated administration), and virtual care solutions and outreach. Seamless care team member communication improves outcomes, provides patient support, and keeps EHR information updated; patient services such as digital scheduling, referrals, reminders, and revenue cycle inquiries create a better patient experience; and telehealth video and outreach provide remote access to specialists and care teams and support care plan coordination. 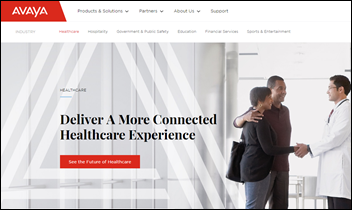 See Avaya at #6451 at HIMSS19 for communications solutions demos. Thanks to Avaya for supporting HIStalk. Thanks to these companies for recently supporting HIStalk. Click a link for more information. Waystar hires Steve Levin (Connance) as chief strategy officer and Bill Barrett (Connance) as general counsel. The SSI Group promotes Mark Blossom to chief data operations officer and Will Israel to VP of enterprise analytics solutions. 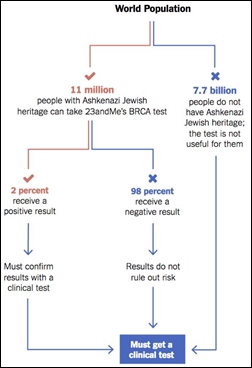 The editorial board of the New York Times warns that 23andMe’s consumer DNA testing performs poorly in predicting the risk of developing chronic diseases because it only recognizes a few relevant genetic mutations and thus isn’t a substitute for medical office testing, calling it “more parlor trick than medicine.” The authors describe the company’s BRCA breast cancer test as “like proofreading a document by looking at only a handful of letters” since 23andMe tests only two rare BRCA mutations while ignoring 1,000 others. The tests also offer predictions for diseases that aren’t most often cause by genetics. The article notes that FDA reversed its decision to allow the company to perform health-related tests only because the company posts a host of disclaimers. In Australia, a law professor questions why any doctor at Queensland Health can change the medical record of any patient in the nine hospitals where IEMR is live. 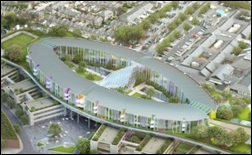 It’s not just this country that spends ridiculous sums erecting ornate hospital buildings that do little to improve patient care or access – the estimated cost of Ireland’s National Children’s Hospital has swollen to $2.3 billion, or $4.7 million per bed. That price doesn’t include IT systems, the research center, and integrating the three existing hospitals that will be combined. The wildly over-budget project is so expensive that only four beds will be added beyond the total of 473 that were already available. 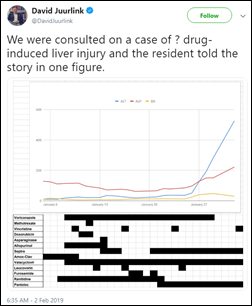 Here’s a good example of something that clinicians do better than EHRs, at least for now – compare the rise in abnormal liver lab results with courses of drug therapy to see what caused the damage (or false positives, you could also interpret). This might be something that a well-trained machine learning algorithm could have kicked out as suspicious. This is a fresh take. IT systems often provide value in catching physician mistakes, but sometimes are over-programmed as an enforcement tool by hospital executives and ancillary departments who are convinced that doctors will harm patients without their wise oversight. That’s a dynamic that needs to be better understood – just how clinically autonomous should physicians be? What organizational structures and policies best protect the patient’s interests? Are we expecting too much or too little from the decision-making of doctors? 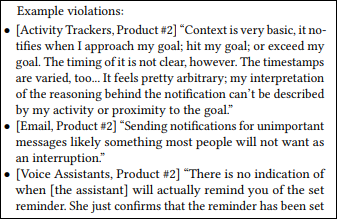 Should we trust them to turn off EHR oversight (like certain warnings or informational pop-ups) that they find more intrusive than helpful? If medical practice is to be standardized and corporatized, what is the best use of physician expertise? LiveProcess publishes a hospital emergency preparedness self-assessment quiz. Health systems realize significant financial benefits from AI-driven revenue cycle solutions from Recondo Technology. Pivot Point Consulting will exhibit at the AHA Rural Healthcare Conference 2019 February 3-6 in Phoenix, AZ. Zen Healthcare IT partners with Aigilx Health to deliver healthcare data exchange and interoperability services. … unless it’s pancake related. I used to love Pink Floyd until Roger Waters became an outspoken anti-Israel / BDS (Boycott, Divestment, Sanctions) supporter. He has persuaded other artists to cancel planned concerts in Israel. Now I won’t listen to Pink Floyd songs on streaming services and change the station when a Pink Floyd song comes on in my car. If that Israeli cure for cancer turns out to be the real thing and Roger Waters needs it one day, I wonder if he will refuse treatment. I like to think he was an idealistic, open-minded younger man back in the Pompeii days before his bitterness over Pink Floyd continuing without him, although perhaps some of his broad anger was at least channeled creatively 40 years ago in “The Wall.” Waters was also kind of a jerk in a Floyd documentary in which he complained endlessly that his solo shows couldn’t fill small venues while the remaining Pink Floyd was selling out stadiums at which they sang his songs (there’s a couple of powerful branding messages in there). Concerning Dignity Health and CHI- Is Dignity on Epic? CHI in the Northwest is. There was some friction between the NW region and Denver at one time I think. Some of the other CHI hospitals I think were on Cerner. Dave N – Dignity is almost exclusively Cerner Millennium, in fact, they are one of Cerner’s largest customers. As for CHI, you are correct, they are around a 50/50 split between Cerner and Epic. The 30+ sites on Cerner are under the ITWorks organization at Cerner. It will be interesting to see, once a full time CIO is named, if they do migrate to a single EHR or if they just integrate what they have now, replacing aging legacy systems as they seem fit. I am still trying to understand why the move to Chicago for the corporate office, where they have NO footprint. Also would love to be a fly on the wall to understand why the previous CIO, who was incredibly compensated, would leave for Banner Health, and per the 990 Tax records, would seem to be a pretty substantial decrease in compensation. I know you’re an anonymous sleuth at HIMSS but it sure would be informative for you (and us) to go to some vendor parties and report back. Those of us who slave away back at the office are curious about the goings on and wait with baited breath for your cynical humor and skewers to the heart of likely well meaning but foolish HIMSS attendees! I’m gonna ruin the surprise here… it’s usually a bunch of vendor employees getting drunk in a corner, while clients wander around. The clients are usually either (a) party hopping and using up their drink tickets ASAP so they can get to the next event or (b) not really sure why they’re there and looking for someone to talk to. There is very little business related activity that goes on, at least not in the many parties that I’ve attended over the past few years. This is worse when it’s in Vegas, I think. I had a client ask if I could pay for bottle service for their team at some expensive club. When I politely declined and offered to buy them dinner or meet for a drink, they said their rep last year took them out to clubs and paid for everything and that they were disappointed in me. FWIW, as someone who came up through the support/services trenches and made the jump to sales, it’s so sad to see how much money is spent on these events. When you realize your company nickel and dimes clients for small interface updates, or how you can’t get your QA team a pizza party, or you get dinged if your $5 Starbucks expense doesn’t have a receipt… and yet it’s fine to drop thousands to get a sales team drunk in a hotel conference room with fancy lights and a DJ and tons of wasted food and copious amounts of booze. It’s fun, don’t get me wrong, and I appreciate the marketing folks that put these events on, but it sobers you up real quickly if you stop and look around and wonder if it’s worth it. I recently viewed a presentation by Dr. Brent James, currently at David Eccles School of Business, formerly CQO at Intermountain Health. If we are ever going to get to a good place with physicians, EMRs, and IT, we have to view this as a partnership. Clinicians can learn a lot from EMR data if they are open to doing so. The only way that’s going to happen is if clinicians are in charge of big chunks of the EMR (policy, implementations, rules, alerts, etc. ).